I got back into the swing of things this month, even though it didn’t really feel like I got much reading done. I kind of did it all in spurts. I was hoping for some more relaxation time where I can sit with a glass of iced tea and read, but that just hasn’t happened. And maybe at this stage of life, with two small children, it’s just not realistic. Either way, I did manage to get some reading done. First, I finished up the Divergent trilogy at the very beginning of the month. Allegiant was a little disappointing, but that seems to be de riguer for YA trilogies. While trying to find something that qualified as a story with a love triangle, I was disappointed to realize that I may need to read another YA trilogy, since that seems to be where a lot of them are. I’m hoping to find something else, but it sure seems to be that love triangles are a big YA thing. And it’s always two boys fighting over a girl. Our book club pick for July was To Kill A Mockingbird, sort of in anticipation of the release of Go Set A Watchman, the follow up that Harper Lee may or may not have wanted published. I didn’t manage to finish it all beforehand, but I still really enjoyed it. I was also pleased that it fulfilled a box on my list since I hadn’t even thought much about my Pulitzer book. Next was Eleanor & Park, which I had high expectations for and was disappointed. This is the problem with expectations. Not only was I told that it was a great book (it wasn’t) but I was also prepared for something really sad (it wasn’t). I think I might have really enjoyed this book as a teen, but it just wasn’t enough. Some books stay with you long after you finish them, but this one really didn’t. My last book of the month, and another let down, was Irish Girls About Town. I had planned this one as my short story collection from pretty much the beginning of the year, because I’ve had it for ages and I wanted to read it. And the only reason that I kept with it is because time on my challenge is running short. (And since I’ve had it for ages, it fulfilled two boxes!) I’ve read some of these authors before and liked their work, so I was really disappointed at how awful most of the stories were. Part of it was the weird Irish slang that I didn’t understand, but a lot of the stories were just bad and desperately needed some editing. This is a case where Goodreads ratings really don’t match up to expectations. Even the negative reviews don’t really get at what my issues were. There’s a lot of “eh, all the stories end up with someone needing a man to be happy” and that wasn’t really my takeaway. I just felt like the stories were either uninteresting or poorly written. It was for charity, so maybe that should have been a clue? I’m currently reading Lady Chatterley’s Lover and Beloved (for book club). I have been reading the former in fits and spurts since I’m reading it through Oyster on my phone, so whenever I have a few minutes down time, maybe waiting for something, I’ll read a few pages. I have a week to finish Beloved, so I need to get cracking on that before I run out of time! I haven’t quite figured out what is next after those. I should probably choose my book published this year. I haven’t decided if I’m going to do Go Set A Watchman or not. As I am now past halfway through the year, I’m trying to double up on my boxes so that I can have a fighting chance of completing it, but I also want to read good books and not garbage ones. It’s tough! 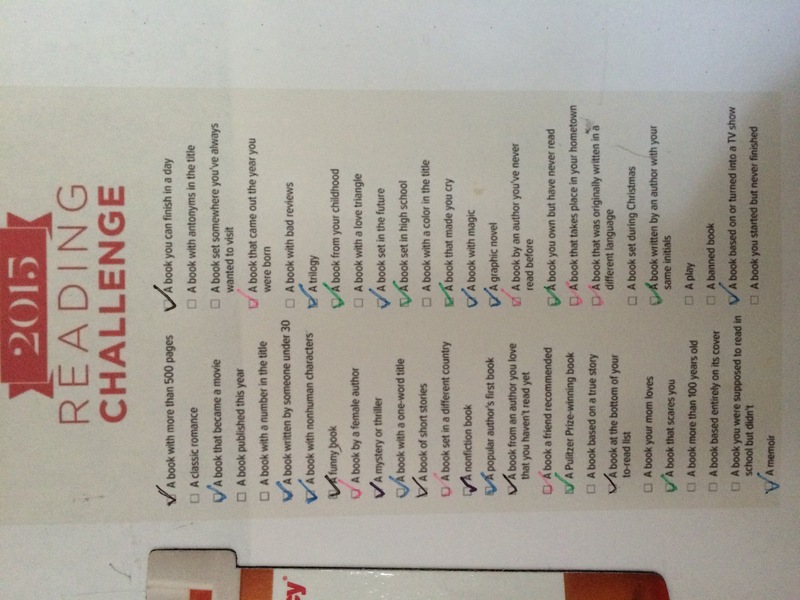 I read 4 books this month and checked off 4 more boxes, which leaves me at 23 books read and 33 boxes checked! I’m almost at my books read goal for the year, so that’s exciting. Just 28 more boxes to check. Yikes!